Bask in the magnicificence of my circitude. I survived the second aerials class! This time, we did foot locks on the tissu (You end up with one foot bound up; which allows you to use your arms and the other leg to do things). I had my first acrobatics lesson this evening! …Imagine, if you will, someone lying on their back. Their arms straight up in the air, and their knees bent at close to right angles. Then, imagine another person, the person you are imagining is me. My hands are on the other persons’ knees, my shoulders are in their hands, and the rest of me is doing a handstand (with ample spotters ready to catch me (: ). Moh. Unpossible! 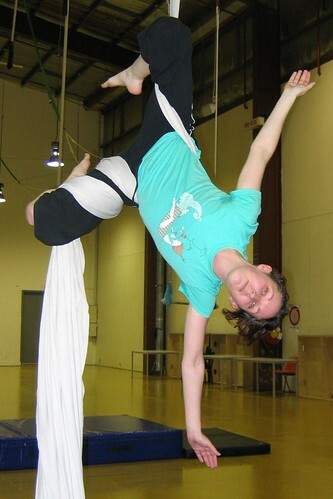 …Consider the possibility, of being balanced at the waist, arms outstretched (although I was kinda wobbly). Unpossible! …And this other balancing thing, where one person bends at the knees, the other person stands on their thighs, and they both lean back and no-one falls over (much) (I didn’t!). And that was my first acrobatics lesson! I’m entering a world of pain.. I started an aerials course yesterday (six weeks/1.5 hour sessions – it’s spread out). 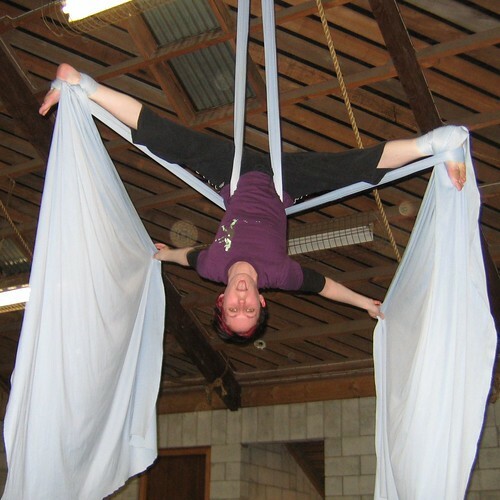 It’s pretty fun stuff (: We do a combination of trapeze stuff and tissu stuff. 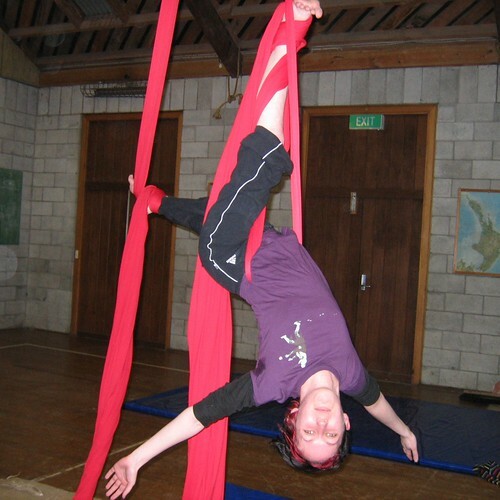 Tissu is neat – it involves climbing up long sheets of fabric, and having the fabric hold you in place (Yesterday, we learnt how to climb up and get back down again; and we all suspended ourselves with fabric looped around our hips). 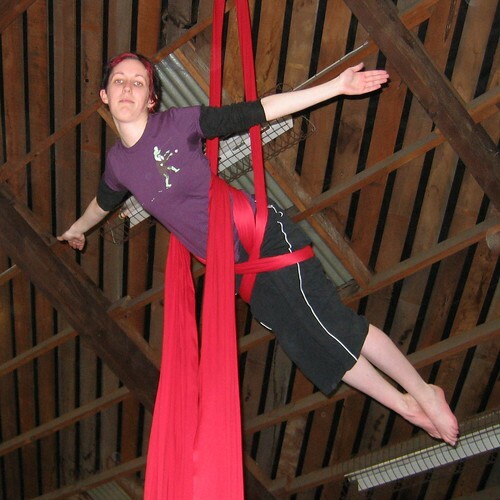 Trapeze is the kind of thing you’d expect…except wobblier!